Injera (Amharic: ənǧära እንጀራ [ɨndʒəra]; sometimes transliterated as enjera; or "taita" Tigrinya: ጣይታ) is an East African sourdough-risen flatbread with a unique, slightly spongy texture. 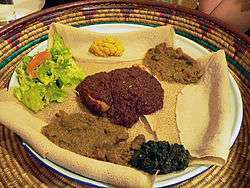 Traditionally made out of teff flour, it is a national dish in Ethiopia and Eritrea. Different varieties of injera rolls (black and white?) at a restaurant in Addis Ababa. Injera is usually made from the tiny, iron-rich teff. However, teff production is limited to certain middle elevations and regions with adequate rainfall, so it is relatively expensive for the average household. As many farmers in the Ethiopian highlands grow their own subsistence grains, wheat, barley, corn, and/or rice flour are sometimes used to replace some or all of the teff content. Teff flour is gluten free, therefore Injera that's made only with teff flour and water is gluten free and has higher demand. There are also different varieties of injera in Ethiopia, such as tekore (black ), nech (white), and sergegna (mixed). Batter is poured rapidly in a spiral from the outside inwards. In making injera, teff flour is mixed with water and allowed to ferment for several days, as with sourdough starter. As a result of this process, injera has a mildly sour taste. The injera is then ready to be baked into large, flat pancakes. Unusual for a yeast or sourdough bread, the dough has sufficient liquidity to be poured onto the baking surface, rather than rolled out. In terms of shape, injera compares to the French crêpe and the Indian dosa as a flatbread cooked in a circle and used as a base for other foods. The taste and texture, however, are unlike the crêpe and dosa, and more similar to the South Indian appam. The bottom surface of the injera, which touches the heating surface, will have a relatively smooth texture, while the top will become porous. 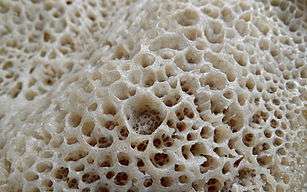 This porous structure allows the injera to be a good bread to scoop up sauces and dishes. Baking is done either on a specialized electric stove, or more commonly, on a large, black clay plate over a fire. This set-up is a stove called a mitad (ምጣድ) (in Amharic) or mogogo (ሞጎጎ) (in Tigrinya). The clay plate can be difficult to use, produces large amounts of smoke, and can be dangerous to children. Because of this inefficient cooking method, much of the area's limited fuel resources are wasted. However, in 2003, a research group designed a stove, which uses available fuel sources (including dung, locally called kubet) for cooking injera and other foods efficiently, saving the heat from the fuel. This cooking method was intended for designing a new type of stove. Several parts are made in the central cities of Ethiopia and Eritrea while other parts are molded from clay by women in local areas. However, many women in urban areas now use electric injera stoves, which are topped with a large metal plate. In the United States, injera is most often made on an electric Bethany lefse grill, now marketed as "Heritage grill". In Ethiopia and Eritrea, a variety of stews, or sometimes salads (during Ethiopian Orthodox fasting, for which believers abstain from most animal products) and simply more injera (called injera firfir), are placed upon the injera for serving. Using one's right hand, small pieces of injera are torn and used to grasp the stews and salads for eating. The injera under these stews soaks up the juices and flavours of the foods, and after the stews and salads are gone, this bread is also consumed. Injera is thus simultaneously food, eating utensil, and plate. When the entire "tablecloth" of injera is gone, the meal is over. In Ethiopia and Eritrea, injera is eaten daily in virtually every household. 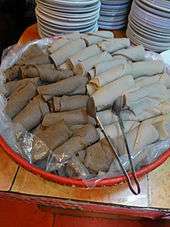 Outside of the Horn of Africa, injera may be found in grocery stores and restaurants specializing in Ethiopian and Eritrean cooking. ↑ Cauvain, Stanley P.; Young, Linda S. (2009). The ICC Handbook of Cereals, Flour, Dough & Product Testing: Methods and Applications. DEStech Publications, Inc. p. 216. ISBN 1932078991. Injera is the fermented pancake-like flatbread, which originated in Ethiopia and neighbouring countries. ↑ Tesfai, Tekie (2011). ዘመናዊ መዝገበ ቓላት ትግርኛ (in Tigrinya) (2nd ed.). Asmara: Hidri Publishers. p. 1083. ISBN 978-9994801039. ↑ Burdett, Avani (2012). Burdett's Delicatessen Recipes. Springwood emedia. ISBN 1476144621. ↑ "Somali Anjero (Canjeero) « Vegan Recipes « Vegan Magic". vegan-magic.blogspot.com. Retrieved 2015-10-26. ↑ Cauvain, Stanley P.; Young, Linda S. (2007). Technology of Breadmaking. Springer. p. 225. ISBN 0387385657. Fassica: Gluten Free 100% Pure Teff Injera U.S.A. Ethiopian food recipes - Vegan, Gluten Free, and more.